With one in four people experiencing a mental health issue at some point in their lives, the need to raise awareness and encourage supportive and understanding attitudes to mental health is a key priority for health and social care service providers. 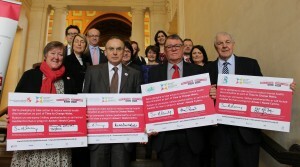 On 11th February 2016, the Chief Executives and Leaders from Councils in Bridgend, Neath Port Talbot and Swansea, along with the ABMU Health Board’s Chief Executive and Chairman publicly declared their commitment to the cause by signing the Time to Change Wales organisational pledge during a meeting of the Western Bay Programme’s Partnership Forum. Signing the pledge means each of the organisations recognises the importance of supporting both employees and members of the community who are struggling with mental health issues. The pledge itself is accompanied by a detailed action plan which outlines the practical steps each organisation is taking to promote mental health and well-being. Actions within the plan include the provision of counselling services for staff, as well as courses and events designed to reduce stress and enhance personal well-being. “We’re very pleased to join the campaign which sends a clear message of support to those suffering with mental health problems of all types. This is something that touches the lives of thousands across the region and it’s important to get people talking and to challenge prejudice and discrimination”. A series of self-help guides on emotional health and well-being are available at www.selfhelpguides.ntw.nhs.uk/abmu and were produced in 2015 as part of the Western Bay Programme’s Prevention and Well-being work stream.